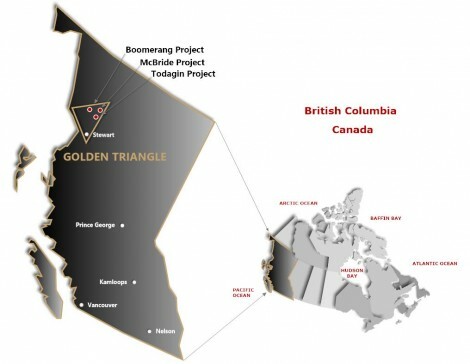 HAWKEYE owns a 100% interest in the 3,744 hectare Boomerang Project (the “Property”) situated in the Golden Triangle approximately 30 kilometres south of Telegraph Creek, British Columbia, Canada. The Property is located northeast of Yehiniko Lake and contains numerous drainages, including Boomerang Creek,with highly anomalous gold values reported in regional stream geochemistry programs. 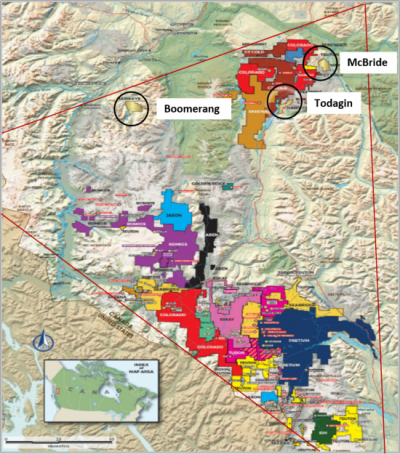 HAWKEYE’s Boomerang Project is situated directly south of Telegraph Creek, BC, and northeast of Yehiniko Lake which drains north on Yehiniko Creek to the Stikine River. The claims are transected by Boomerang Creek in the south and another unnamed creek in the north, both of which contain numerous peripheral drainages from a major WNW-oriented topographic high following the Hazelton Group geology. 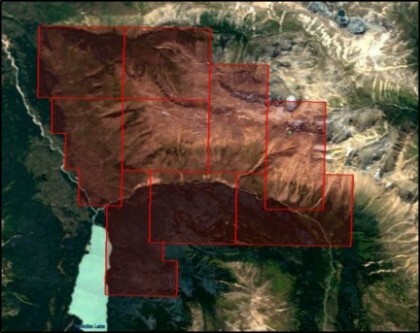 The Property is situated in the northwestern section of the Golden Triangle, positioned approximately 25 kilometres northwest of TEck and Copper Fox’s Schaft Creek deposit and 50 kilometres north of the Galore Creek deposit held by Teck and Novagold. The Boomerang Project is an area that has seen very limited exploration. Groupings of claims located several kilometres to the west and southwest of Yehiniko Lake have been the principal areas of focus for gold and copper exploration reported since the 1970’s. The 1988 regional stream geochemistry indicates numerous priority drainage targets on the Boomerang Project based upon the identification of multiple anomalies with >98th percentile gold values, and corresponding base and heavy metal pathfinder elements. Similar to Hawkeye’s McBride and Todagin properties and those held by GT Gold in the northeastern section of the Golden Triangle, the principal geological units underlying the claims comprise the Hazelton and Stuhini Groups with precious and base metal mineralization commonly associated with structural controls or porphyry systems within and adjacent to intrusions. The Jurassic-age Hazelton basalt, andesite, dacite and rhyolite flows and pyroclastics unconformably overlie Upper Triassic Stuhini volcanics and volcanoclastic deposits. Both Stuhini and Hazelton lithologies are underlain by Mid to Late Triassic quartz diorite intrusions and the volcanic deposits occur as outliers bounded in large part by these intrusions. Hazelton and Stuhini rocks are intruded by Early to Mid-Jurassic plutons comprising the Cone Mountain granodiorite and the Three Sisters tonalite. Coarse clastic sediments of Cretaceous to Paleocene age overlie the Hazelton and Stuhini to the south and west on the Property. Previous fieldwork in the general area included regional mapping and stream silt geochemical surveys by government geologists. Reconnaissance soil, silt, moss and rock sampling, and ground geophysical programs focused on district-scale Cu-Au porphyry targets associated with the above-noted plutonic suites. Exploration reported background to anomalous values for copper (up to 7270 ppm, 0.73% Cu), zinc (up to 755 ppm), lead (up to 2143 ppm) and gold (up to 260 ppb), the highest base metal values from heavily altered Hazelton volcanics. Gold reported at 1380 ppb (1.38 g/t Au) with copper (1614 ppm) occurred in one sample of granitic float. The geochemistry maps showed localized anomalies, including coincident copper-zinc, which showed west-northwest alignment with magnetic features, and were consistent with the general geological, topographical and structural fabric. Gossan zones exhibit pervasive hydrothermal alteration including bleaching and secondary oxides after sulphides. Epidote and disseminated to vein-style sulphides, identified as pyrite, chalcopyrite and secondary copper oxide-carbonate, malachite, were reported in the volcanic lithologies adjacent to weakly altered dyke swarms and other intrusions of quartz monzonite to quartz diorite.